In Warnings I write about the WKY TV (now KFOR TV) weather department and my boss, Jim Williams. 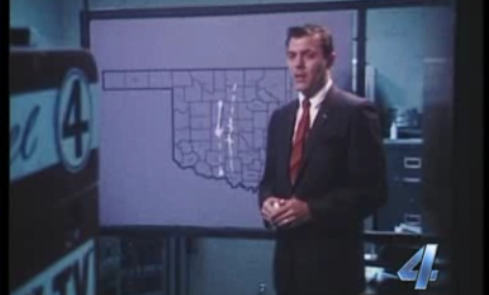 KFOR, one week ago, did a story comparing TV weather warnings then and now and included some clips of Jim from those days and interviewed him talking about today's warnings. It is great to see Jim looking well today. The story is here. And, note the liquid chalk dispenser in Jim's right hand is the one that he used to draw the white lines on the map. I believe that is the same map and the same liquid chalk dispenser I used when doing storm warnings from the WKY weather department.